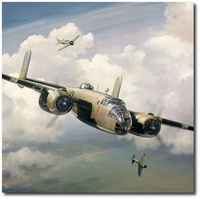 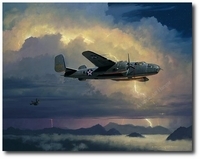 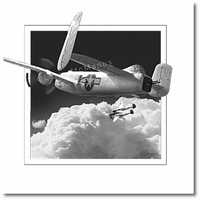 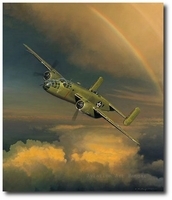 The B-25 Mitchell medium bomber was one of America's most famous airplanes of WW II. 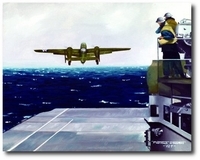 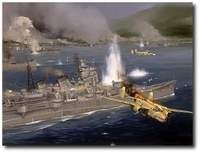 It was the type used by General Doolittle for the Tokyo Raid on April 18, 1942. 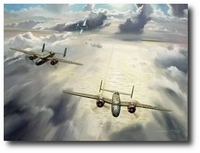 Subsequently, it saw duty in every combat area being flown by the Dutch, British, Chinese, Russians and Australians in addition to our own U.S. forces. 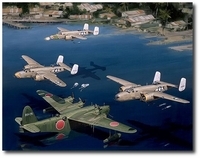 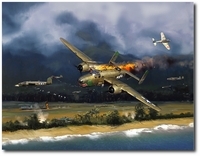 Although the airplane was originally intended for level bombing from medium altitudes, it was used extensively in the Pacific area for bombing Japanese airfields from treetop level and for strafing and skip bombing enemy shipping. 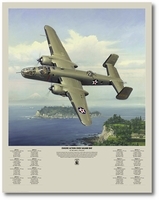 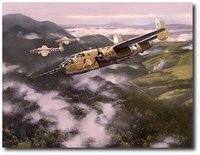 More than 9,800 B-25s were built during WW II. 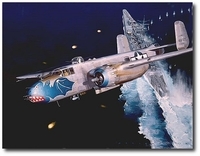 "Evasive Action Over Sagami Bay"
"Fuel State Critical - Outcome in Doubt"
"Into the Arms of the Dragon"
"Into the Teeth of the Wind"
"Mission Complete, The Journey Continues"
"Out of the Dragon's Den"
"Release Your Brakes and Hunt for Heaven"
"Westbound: A Date with the General"